Home › News › Interested in owning your very own piece of SYFY & Harley-Davidson gold? Interested in owning your very own piece of SYFY & Harley-Davidson gold? Arnold Schwarzenegger “Terminator” screen-used 1991 Harley-Davidson Fat Boy motorcycle from Terminator 2: Judgment Day. (Carolco, 1991) Without question, one of the most iconic vehicles in cinema history, Arnold’s black Harley-Davidson Fat Boy has left an indelible mark in the minds of movie fans worldwide due to the Terminator’s daring rescue of the young John Connor from the clutches of the seemingly unstoppable T-1000. 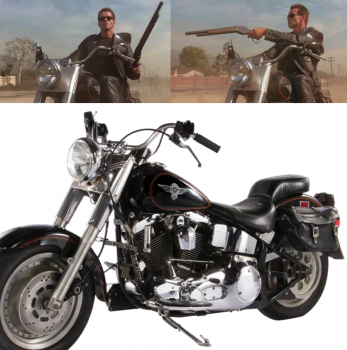 In addition to the on-screen presence, the motorcycle played an integral role in the marketing of the film, being featured on the film poster and countless other promotional artwork depicting Arnold wearing his leather jacket and pants while straddling the motorcycle and carrying his lever-action Winchester shotgun in his right hand!